Episode 12: I Am Gandor, Thunder Stealer! In Episode 12, Greg and Joey talk about gold in Georgia, grammar, and the stealing of thunder. Giveaway: We gave away a copy of Modern Lopi: One by Lars Rains. Thanks to KnitVentures and Lars Rains for the review copies and prize. 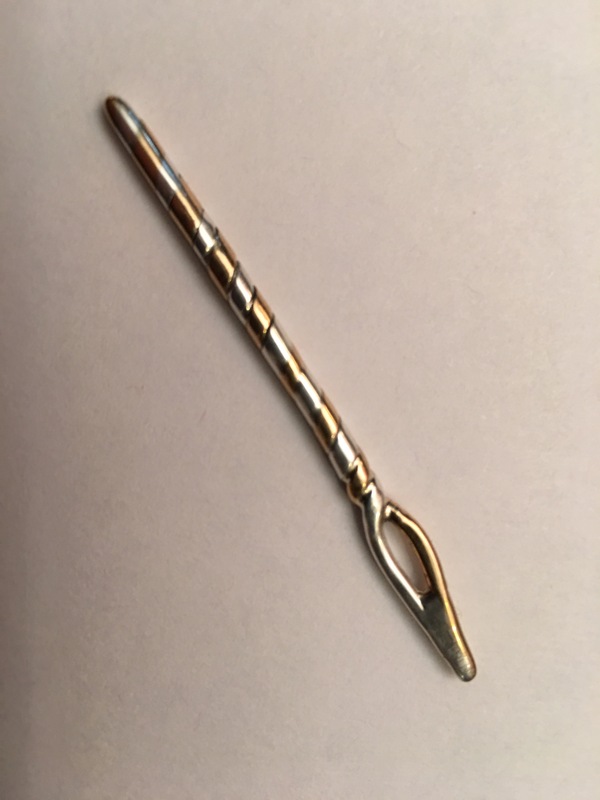 Joey received a handmade Bronze/Sterling Flame Eyed Yarn Sewing Needle from Leslie Wind, owner of the lesliewind etsy shop. It’s beautiful, functional art. Strie Socks, Top Down by Lara Neel from her Sock Architecture (affiliate link) book — Greg’s socks. He’s incorporating the Fish Lips Kiss Heel by Sox Therapist, and loving how the FLK Heel is working out (project page). Next time Greg knits a FLK Heel, he’s going to use the instructions on how to do it in a contrasting color. Knitted Patchwork Recipe by Martine Ellis — Greg’s Scrappy Sock Yarn Blanket (project page). Joey’s also knitting this, but he’s using worsted weight yarn because that’s what he has the most of. Susan B. Anderson Workshop at The Fibre Space: Greg is attending. May 19-21. Greg plans to be in Cary, NC at Warm N’ Fuzzy. Michelle from Actually Knitting will probably be there, too. Esse quam videri (To be, rather than to seem) — the North Carolina State motto. Square by square, getting there. Estimated time to completion: 10 years maybe? *shrug* I'm in no rush. Now that I've got almost two dozen hexipuffs, it's neat to see how a quilt might actually start to shape up. Where is the Speedo photo? !